Hello from the beautiful west coast of BC, Canada! My name is Shawn and I’m pretty much a ‘newbie’ in the quilting game when compared to many of the wonderful quilters out there. My first quilt was made during my grade 12 Home Economics class, a simple 9-patch on point and the fabric was polyester Fortrel – the fabric that never dies! I still have that quilt tucked away looking just as new as when I made it. I did more garment and drapery sewing for many years while I raised my family. It wasn’t until just a few years ago that I became interested in quilts again and decided that I wanted a hand-made quilt. I fell in love with Hawaiian quilts while on vacation and then again with the beautiful hand-quilted works of art I saw in Nova Scotia a short time later. The price tag on these quilts made me think twice and I decided that I could make a quilt myself. After all, I’ve made and designed clothes and drapery how hard could it be? Well, famous last words of course. After walking into a quilt store and spending a couple hundred dollars, my second quilt was a small lap quilt and I realized that perhaps those price tags weren’t so far off the mark and now that I’ve spent a few years quilting I know that those price tags didn’t include the time, experience and love that goes into them. Quilting is one craft that I actually finish. I had bags of knitting, crocheting, cross-stitch, embroidery, scrapbooks… the list goes on, but I finished the quilts. Probably because the actual quilting of the sandwich is what I enjoy most. It allows me to be creative and it brings life to the top. I invested in a mid-arm quilting machine and frame system because I was no longer able to push my quilts through my sewing machine and my quilts were getting smaller and smaller! What a learning curve! 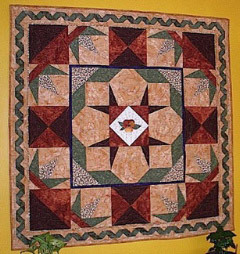 Pushing your quilt through a sewing machine and pushing a quilting machine around on a frame may give you the same results on the quilt but the path to get there is totally different! I was so intimidated after setting up the machine that I looked at it for few days before doing anything. You can find some wonderful sites on-line for long-arm quilters to share and learn skills now but back then I couldn’t find many nor could I find Superior Threads in Canada, my personal choice for quilting and sewing threads. I started Bailey’s Quilting HeadQuarters so quilters in Canada had easy access to this wonderful thread and my blog, ThreadTails, to journal the ups, downs, successes and even the failures of learning this fulfilling craft. All my quilting is hand-guided, no computer assistance here, and now that I’m retired I can focus on my business and start perfecting my quilting skills. Thank you to Michele for inviting me to share my blog with you. As a thank you to all my readers we’re offering the chance to win a cone of King Tut quilting thread free! Visit ThreadTails and leave a comment telling us what colour of King Tut premium quilting thread you would use on your next project. If you’re not sure which colour you would like check out Baileys Quilting HeadQuarters and look through all the beautiful colours available. On February 18, 2009, we will choose a random winner from all the comments and the winner will be sent a 2000 yd. cone of King Tut in their colour choice free! What a great opportunity to get to know more about you! I’ve been following your blog, since I heard you were moving to our little neck of the woods. 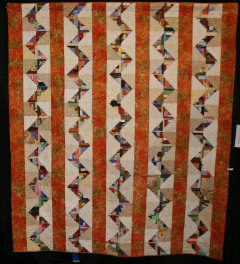 Your experiences with quilting are very similar to mine. Glad to have you moved to our community.Love the king tut thread you carry in your business and just used white linen and it did a beautiful job.